Apple's rally has further to go this fall. October could be a significant month. It's been another blockbuster year for shares of Apple Inc. (AAPL - Get Report) - since the calendar flipped to January, shares of this tech behemoth have charged approximately 37% higher on a total-return basis, leaving the rest of the broad market in its dust. To put that into perspective, if every other stock in the S&P 500 was unchanged at this point in 2018, the big stock market index would still be up about 1.5% year-to-date thanks to Apple alone. And there could be more upside for Apple investors where that came from. Shares are closing in on a key breakout level in October. To figure out how to trade it, we're turning to the chart for a technical look. It's not hard to spot the general trend in Apple's stock price in 2018 - shares have been trending up and to the right, pressing up against all-time highs this fall. At a glance, it might seem like Apple's price action has stalled out in the short-term. Shares made effectively zero progress in September, swatted lower on every attempt at the $230 level. In fact, Apple's sideways consolidation just below $230 isn't an anomaly; it's a pretty constructive move after the nonstop rally that shares have enjoyed year-to-date. September's cooling-off period gives buyers a chance to take a breather before this stock's next leg up. In technical parlance, Apple is currently forming an ascending triangle pattern, a bullish continuation setup that's formed by horizontal resistance up above shares at $230, with uptrending support to the downside. A breakout above $230 is the signal that it's a high-probability time to be a buyer in Apple. That may seem strange - but because $230 has acted like a ceiling of sorts in the near-term, it indicates that there is currently a glut of supply of shares at that price level. A breakout that puts shares above $230 is the signal that increasingly aggressive buyers have absorbed that excess supply of Apple that sellers were willing to let go of at $230, giving way to more upside. Like with any stock in an uptrend, risk management is crucial in Apple. The 200-day moving average has been a good proxy for Apple's long-term trend - that makes it a logical place to park a protective stop beneath. 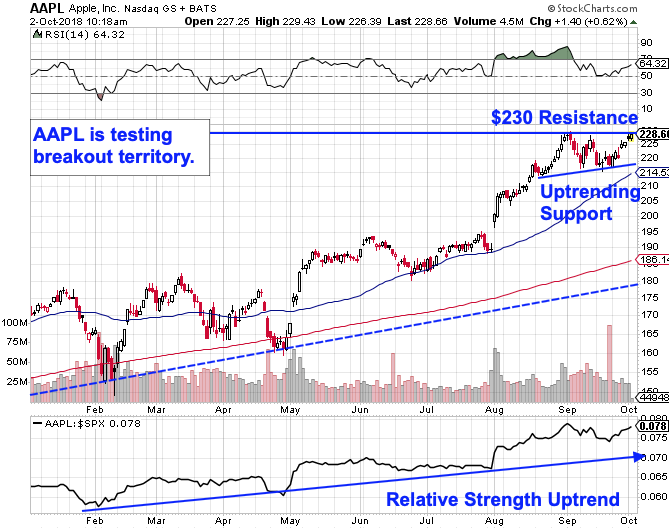 If Apple violates the 200-day, the uptrend is over. Meanwhile, new highs look likely for Apple in October. Want to Buy Stocks for a 10% or Greater Discount? You can with certain so-called "closed-end" mutual funds - an often overlooked investment class. Click here to register for a free online video in which TheStreet's retirement expert Robert Powell and an all-star panel run down all you need to know. This article is commentary by an independent contributor. At the time of publication, the author was long AAPL. Pot stocks may have cooled off in recent months but the industry is still hot and Bank of America Merrill Lynch expects it to get hotter as it reaches maturity. This year's annual 420 bash is expected to ring up more than $1 billion in sales for marijuana retailers, with festivals and events planned from San Francisco to Miami.